Nuala and I agreed last week that after Berlin we would cruise for long days and get back to Koblenz (825 km away), as soon as possible in case the water levels on the Rhine start to rise. 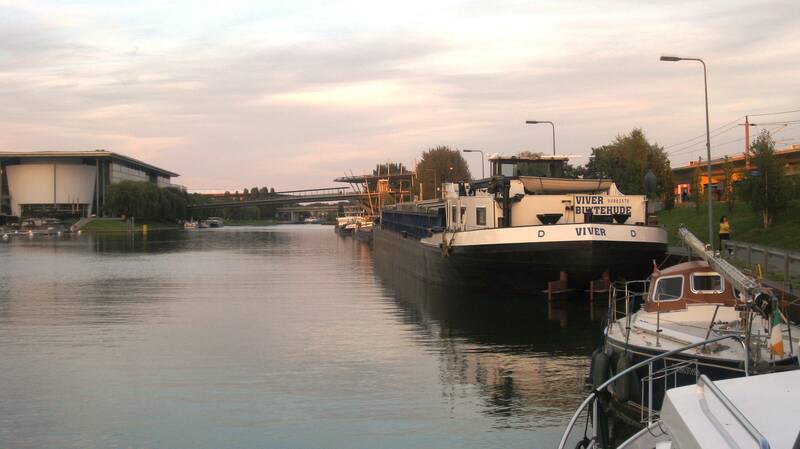 That was four days ago but then there was the stop at Potsdam and now we are moored at Wolfsburg. Firstly, talking to Ulrich (one of the boaters we met in Boothaus Roll), he said we should definitely visit Potsdam as it’s a beautiful city. So we broke the rule and went to Potsdam and spent a day there (see previous blog). We told ourselves that we would do longer hours and make up the time.We did that yesterday and motored 11 hours but when we got going again this morning and I looked at the route, I said to Nuala we would be passing the VW factory and I would love to see it as they give guided tours. 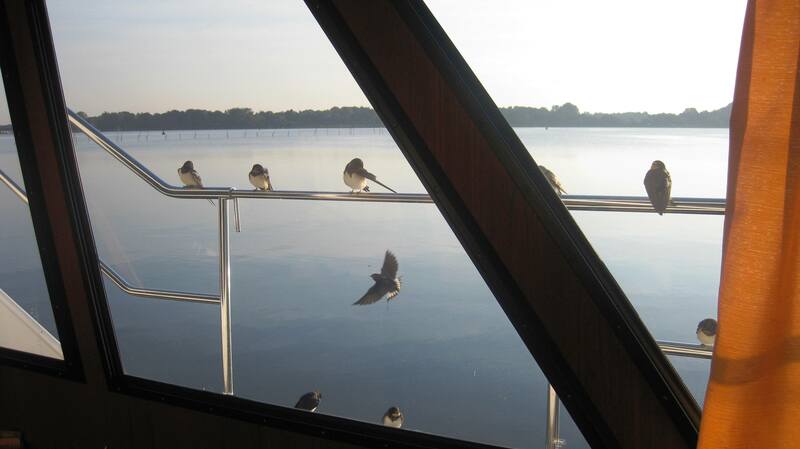 Birds land on boat moored – maybe they are telling us to hurry up and go home before winter! So I looked it up on line and as the web booking system was very confusing, I rang to see if I could book to visit this afternoon. It turned out that they only do English speaking tours at 12.20 each day and we would miss todays. So I asked the booking agent to hold on for a moment, turned to Nuala and said ‘will we stay in Wolfsburg tonight and spend tomorrow in VW?’ She replied ‘why not it’s your birthday soon.’ So I went back to the lady and booked the tickets. 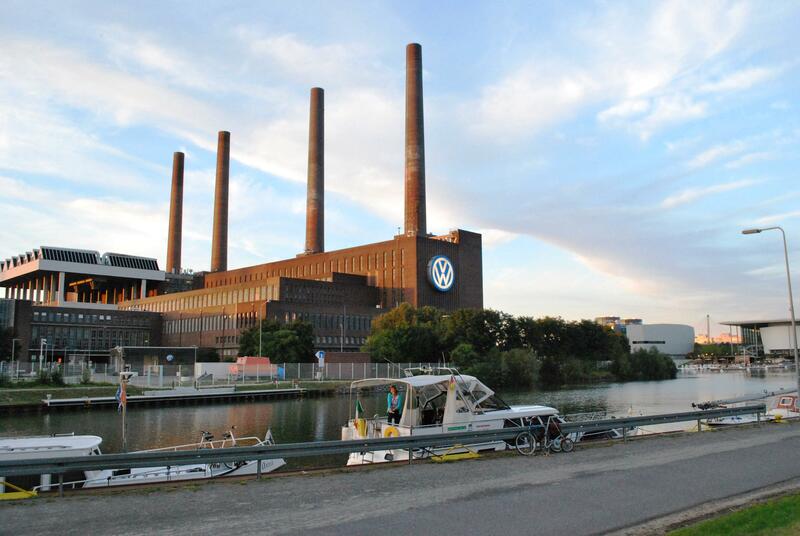 So that is why we are moored up tonight opposite the VW factory. Then Nuala says over dinner tonight that if we stayed an extra day in Wolfsburg to visit a car factory that she wanted to stay an extra day in Munster and go back to that great charity shop she found. Now we will be four days behind a 15 day target! ( 25% out ). If we keep up this rate of progress we might be in Koblenz for Christmas! I will let you know on Friday if the visit was worth while. This entry was posted in Experiences on the Canals, front page, Places visited and tagged Koblenz, Munster, Munster charity shop, Nuala, Potsdam, Potsdam to Wolfsburg, Rising waters on the Rhine, The Rhine, VW, VW factory, VW factory Wolfsburg, Wolfsburg. Bookmark the permalink. Progress as slow as a beetle so far, I’d say!